Where I come from in Germany, Zwiebelkuchen (onion cake, onion pie or onion tart) is a typical early fall specialty. 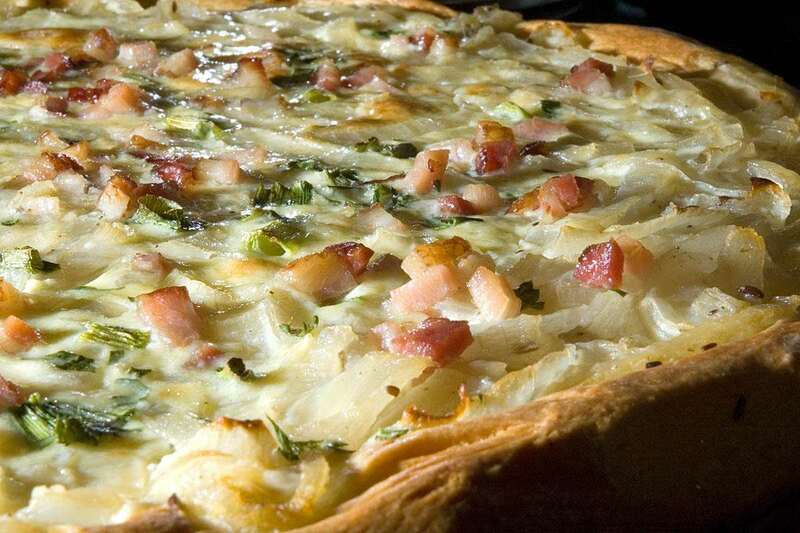 It is made of sauteed onions with cream, egg and bacon on a rich yeast dough crust. It is usually served with Neuer Wein ("new wine"), also known as Federweißer (link to wikipedia). This is my mother's recipe for Zwiebelkuchen. In the notes section is my adaptation of the recipe to use a sourdough starter instead of commercial yeast. If no Federweißer is available, serve with a fruity but dry Riesling. Dissolve yeast in half of the milk. Combine flour, yeast (or sourdough starter), 1 egg, sugar, salt, milk, milk with yeast, water and melted butter. Knead until the dough is smooth and elastic. Form a ball, coat thinly with oil, let rise in a warm place until volume has about doubled. In the meanwhile, heat butter and oil in a large heavy pan over high heat. Add caraway seeds. Add onions, 1 tsp salt and 1 tsp of pepper. Cook for about 15 minutes, stirring frequently and making sure the onions don't brown (turn down heat if necessary). Add wine, cook for another 10 minutes until the liquid has evaporated. Set aside. Whisk together cream, sour cream, eggs, pepper, nutmeg and salt. Add cayenne pepper and stir in chopped parsley. Set aside. Generously butter 2 large pizza pans, 1 tbsp of butter per pan. Divide dough into two equal parts. Stretch or roll out each part and put on a pizza pan. Spray with a bit of water or cover with damp cloth and let rise for another 15 minutes. Top each pan with the onions, pour half of the egg-cream mixture on top and add the green onions and bacon. Bake for ca. 30 minutes until the crust is golden brown and the egg-mixture has set. (It is easiest to bake both pans at the same time in an air circulation oven, alternatively, swap the pans from time to time between upper and lower rack. In a mixing bowl combine 4½ oz / 140g all-purpose flour with 4½ fl oz / 140ml water. Add 1 tbsp of sourdough starter culture. Cover and let stand overnight in a not too cold place until very bubbly. Follow the recipe using 1 lb ½ oz / 460g of flour, no water (only milk) and omitting the yeast. Omit the the bacon or replace it by 2 additional chopped stalks of onion greens. I acquired a taste for zwiebelkuchen in Germany many years ago. I made this recipe recently for friends and everybody loved it. Instead of using this dough recipe, I substituted a recipe for pizza dough that I use (sort of a Chicago deep dish dough with lots of olive oil) and it worked very well. There is a small error in the instructions for the topping: step 3 mentions Salt twice, I think it should say eggs there. No problem though, I figured it out. I also found that zwiebelkuchen freezes and reheats pretty well, so that is handy in case you need to prepare it in advance. Thanks for the feedback and for pointing out the small error - I just fixed it. Great recipe, my Zwiebelkuchen came out PERFECT. I was worried about using cold milk for the yeast, but the dough has no problems rising. the filling was excellent. I didn't have enough onions so I used leeks, red onion and shallots to supplement. thank you for your conversions, it made things so much easier.